Tuesday’s New York Times featured a front page article — FRONT PAGE — on people who choose home burials for a deceased love one. Economic concerns are given as a key reason for any upsurge in home burials, because they do tend to be less expensive than traditional funeral services. The contemporary practice of home burial (where the body is kept in a private home so that family and friends can see it before burial or cremation) is not new and it most certainly predates the current economic recession. A strong case can be made that ‘home burials’ are actually a return to a more common 19th and early 20th century funereal practice. That said, I want to focus on the current trend reported by the Times. In August 2004, for example, Public Television’s POV documentary film series aired a really fantastic home burial documentary entitled A Family Undertaking. The POV documentary follows different groups of families (each with a dying relative) and shows how the home burial is prepared. All of the families involved demonstrate time and time again how the home burial choice is a labor of love. The fundamentally important part of any home burial is to understand what the local state law says about dead bodies. I say the following with complete sincerity (and as the son of a Funeral Director): most people are capable of handling their own funerals. Here is the most important information to know: 1.) what kinds of permits are required to transport dead bodies, 2.) who signs which pieces of paperwork, and 3.) what the local state law says about the final disposition of the body. Final disposition is a fancy way of saying burial or cremation or any other legally sanctioned form of dead body disposal. Some states give more time than others for final disposition, it depends. Here is the key: ALL American states put their laws online and it is fairly easy to key word search ‘dead body’ or ‘corpse’ to see what the local law states. The Times article also suggests that the renewed interest in home burials is another sign of economic stress. I’m not so sure. I agree that home burials do cost less than a full-on funeral home funeral, but I’m not convinced that economics really drives it. Economic concerns might function as a catalyst but it seems to me that many people choose home burial because it feels more meaningful. I think that a better gauge of economic duress is this: the increase in unclaimed bodies in county morgues. These are situations where the next of kin cannot afford to pay the various burial costs so they leave the body in the morgue and local officials take care of the corpse. All of this is to say, that as individuals begin to choose more and more varied forms of final disposition we will see increasing funereal variation, such as home burials. On the one hand, I totally understand this practice and support it. On the other hand, I really enjoy the classic 19th century cemeteries found across America and I would never turn away a chance to be buried in one. Quick aside: the New York Times ran a wonderful article a few days ago on the land surveyor at Green-Wood Cemetery in Brooklyn. The funniest part of the New York Times article is towards the end. 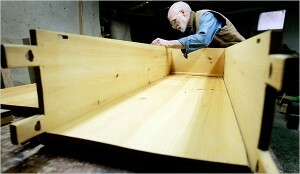 It discusses how Maine carpenter Chuck Lakin makes handmade wooden coffins that can also double as bookshelves or display shelves… until death calls. 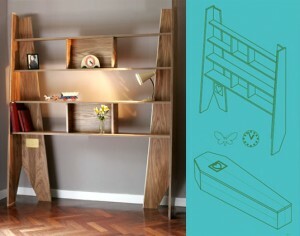 Just by chance, a friend of mine sent me the following link this week on Coffin Shelves: Furniture for Life (and Death). I am a total believer in multi-use coffins. Posted by John in Cemeteries, Death + the Economy, Funeral Industry and tagged coffins, funeral homes, home burial. Bookmark the permalink.